Every medical practice worldwide thrives off efficiency, as well as convenience. 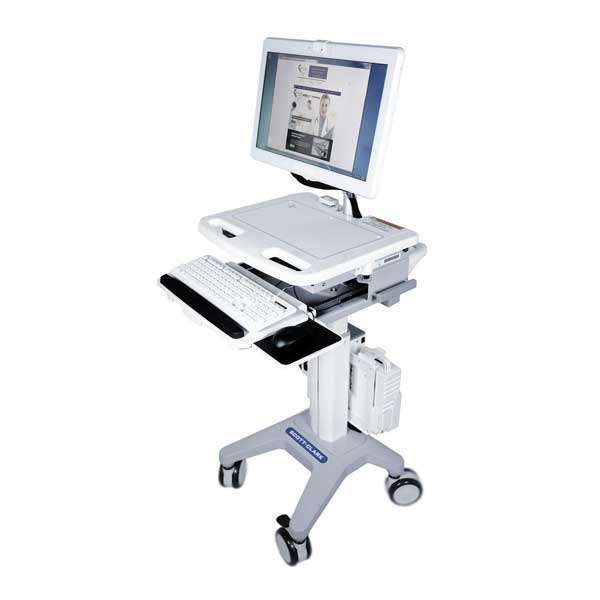 There are a variety of carts available to suit the needs of all medical practices, large and small. In the past, medical practitioners of all professions carried clipboards and manila folders containing mountains of paperwork. This increased the odds that something would get lost, a nurse or doctor may not be able to read someone else’s handwriting, or critical information would be overlooked by a caregiver working a different shift. With a hospital computer cart, you enter the data and it is immediately accessible to whomever needs the information. This significantly improves and streamlines patient care. While there are computer carts available that carry just a laptop, we also have a variety of options equipped with ample storage to handle all your supplies. Here at Scott-Clark, we understand that every patient comes with a set of individual requirements. Scott-Clark carts are available with unlimited drawer combinations. The existing option of a medication bin large enough to fit robotic fill systems is a must have for many practitioners. We not only can supply this, we customize hospital computer carts to meet our customer’s exact specifications. Mobile carts that can carry your supplies, patient information and medications are massive space and time savers for your practice, making them a good investment. Hospital computer carts have come a long way since they were first introduced. 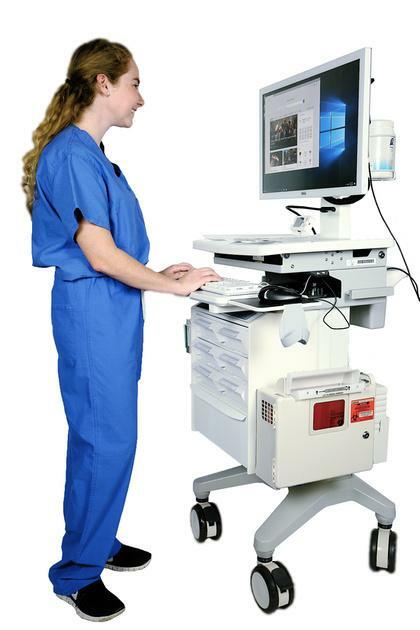 Carts are now standard equipment at virtually all healthcare facilities. Models range from the most basic, carrying only a laptop and a medication label scanner, to an advanced version with two screens, a printer and several supply drawers. Scott-Clark carries special long lasting batteries paired with an at-a-glance battery status feature. You will never run the risk of losing information or face the threat of a shut down during time with a patient. A mobile cart that is easy to move is a must. All the carts we supply here at Scott-Clark are made of lightweight aluminum. They are simple to maneuver and have an easy lift monitor and tabletop for continuous work comfort. The carts are manufactured to minimize noise while moving them from room to room or down the hospital corridor. Our carts are less likely to disturb your patients, especially while administering to patients at night. Mobile workstations are the first step in taking your practice to the next level in patient service and efficiency. Your employees will love the simple and easy technology, and you’ll be pleased with the fact that our carts are compatible with a wide range of PC’s and laptops. Many carts are iPad compatible as well. We offer multiple service plans and have quality refurbished carts available also. Our experienced and knowledgeable staff can help you choose the perfect model at the perfect price to fit your budget. Give us a call today and let us help you streamline your operations and improve patient with a quality hospital computer cart.